I’ve been answering questions about flea beetles recently, which seem to be pretty numerous this year, so I thought I would share the info I have gathered with all. This is lengthy but hopefully helpful. 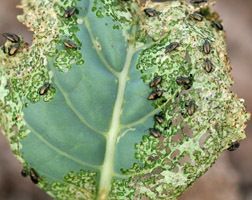 Flea Beetles are very small, very active beetles that feed on numerous garden crops. They usually cause damage that is minimal enough to be tolerated except on leafy greens like lettuce and especially mustard, which they LOVE. You will know them by their hopping action when disturbed, thus “flea” beetle for a common name. There are different species but their effect is the same. They cause tiny holes in the leaves of your crops that can cause them to look skeletonized when they are numerous. When in the larval stage they can cause damage to the roots of your plants, though this is usually negligible. In most years, other than with leafy greens, you do not need to do much to try and manage them. They can cause the worst damage to small seedlings which do not have enough surface area to spare / share with flea beetles. Flea beetle adults overwinter in the soil and come out to feed in May/June (now). They are active into July, laying eggs in the soil near their host plants. The adults die, then the eggs that were laid hatch in 2-3 weeks and feed on roots in the larval form. A few weeks later they emerge as another generation of adults and go back to feeding on the leaves of your plants. In a long growing season there might be a third generation. Tuber flea beetles can cause damage to potato tubers but otherwise there is minimal damage to roots. Pretty much our whole garden, ey? Management techniques, once they are established, are not as effective as doing some pre-planning in your garden. In most years you will not need to worry about them too much as their damage is not significant enough to decrease your crop yields. But to PREVENT big infestations here are some techniques that can help. Keep your garden soil moist in the spring and summer and avoid soil compaction. Flea beetles prefer dry compacted soil and since your plants will also thrive with good soil moisture and aeration it is a win-win situation. Apply loose mulch, like chopped up leaves, around susceptible plants. this makes it harder for the beetles to lay their eggs and keeps the soil more moist and aerated. This also creates habitat for black beetles which love to eat slugs and slug eggs. Plant a trap crop like giant mustard to entice them away from your other crops when you plant your garden. Of course if you love mustard greens like I do then this is not so exciting. And it does not do anything to reduce habitat for them or interrupt their population. But it can be effective. Time your plantings for the windows when the adults are not feeding. If your plants get a chance to grow to about a six leaf stage, the damage they sustain will not be so bad. Rotate your crops in the same season if you can. Flea beetles use chemical cues to find their food and since there are different species feeding on your plants, rotation can help to reduce numbers by moving their food source away from them. This won’t help by itself but can if combined with the techniques above. Apply a silver sheet of mulch around your plants as soon as you plant them. You can purchase reflective mulch through places like Johnny’s Seeds: http://www.johnnyseeds.com or you can use aluminum foil or paint reflective silver paint on cardboard. Ecological considerations of this type of product should be considered since the beetles can be tolerated most years. Use floating row cover over plants as soon as you plant them and make sure you seal the edges. This can only be helpful if you are planting where there are not adult flea beetles waiting to emerge, so where you know there was not an issue last season and where you did not plant susceptible crops before. In a p-patch this technique might not be too useful since we grow so many susceptible crops and our plots border each other, lending habitat to our neighbor’s flea beetles as overwintering sites. Hang out yellow or white sticky traps. They will be attracted to them and get stuck. This is a good method for monitoring and less effective for control. Plus there are the ecological considerations of the materials used and then eventually thrown away. Here is a YouTube tutorial on how to make them for yourself. http://youtu.be/vONXlePZ23U Another consideration is that beneficial insects can also get stuck but then again other leaf eating insects might too, like aphids and white fly. Diatomaceous earth can be used to desiccate the beetles by sprinkling over the plants where the beetles are feeding. It will also desiccate other insects you are not targeting and needs to be reapplied after a heavy rain. And these are tough little beetles and sometimes it does not hurt them. Apply beneficial nematodes to the soil to manage the larvae. If you time it right, this can help. Soil temperatures need to be at least 60 degrees and of course the larvae need to be present in order for this to work. And nematodes are a little pricey. Hand pick them! This is a good choice if you have infinite patience and enjoy a challenge. Catching them in mid air might be a p-patch feat worth celebrating! And make a mighty fine photo! So, basically prevention is the key here and creating a diverse habitat is important. Good luck and may your flea beetles leave you some goods to eat. For more information check out this awesome publication from the combined extensions of WSU, OSU and U of Idaho.